(KPL) Lao Consul General in Kunming Mr Khamphone Vongsanty on 6 November delivered a keynote speech at the promotional seminar themed "Everlasting China-South Asia Expo" held in coincidence with the China Kunming Import and Export Fair in Shanghai, PR of China. 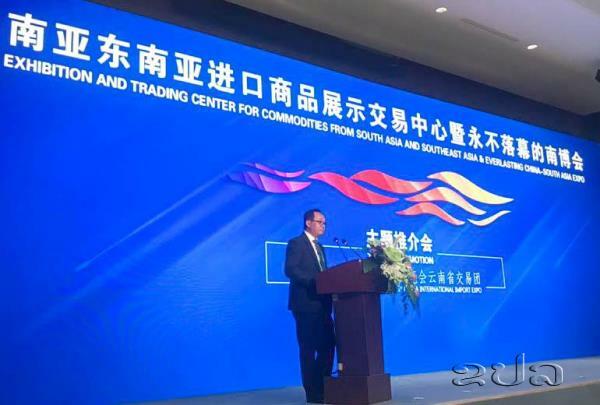 “The China-South Asia Expo and the China Kunming Import & Export Fair play an import role in deepening multilateral diplomacy, economic cooperation and cultural exchanges between China and countries in South Asia, Southeast Asia, and even across the world,” said Consul General Khamphone. Yunnan has played important role in enhancing Lao – China relations. China is the biggest investor in Laos with over 10 billion US dollars invested in 848 projects. Some 256 companies represent Yunnan Province of China. As a result, Chinese enterprises from Yunnan share a larger portion of Chinese investment in the Lao PDR. The bilateral trade volume between Laos and Yunnan reached more than 1 billion US dollars last year. Laos has sustained a moderate to high annual economic growth in recent years with more than 6.5% on average, according to Mr Khamphone. Due to Laos has rich natural resources especially minerals, hydropower, forest etc, the Lao government is making active efforts to create favourable conditions for foreign investment especially by establishing special economic zones, he said. The Lao government has approved a total of 13 special economic zones and specific economic zones with a total area of 20,000 ha. A lot of investment potentials remain untapped for Chinese investors in agriculture, infrastructure, manufacturing, energy, tourism sectors.